THE WRITING BUDDHA - Opinions | Books | Movies: Swami in a Strange Land by Joshua M. Greene (Book Review:- 2.5*/5) !!! 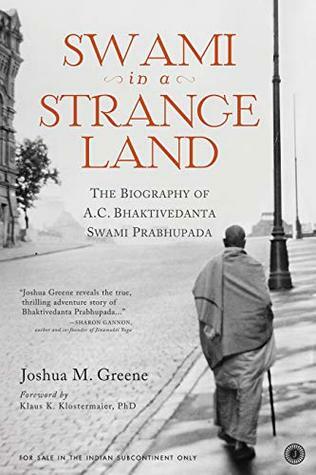 Swami in a Strange Land by Joshua M. Greene (Book Review:- 2.5*/5) !!! It is quite evident to all of you who have been following my book reviews and personal blog that I am quite attracted towards spiritual concepts and the first thing that attracted me towards mythology and spirituality was when I picked up a copy of Bhagavad Gita: As It Is being sold by Iskcon volunteers on a Mumbai local railway station. This version of Gita is written by Iskcon founder, A.C. Bhaktivedanta Swami Prabhupada. And who would not want to read about the personality which introduced you towards a new concept in life. Jaico Publication published the biography of Swami Prabhupada written by Joshua M. Greene recently which has become the 52nd book I read this year thus completing my annual target of 2018. The book covers the spiritual life of Prabhupada on his devotion towards his Guru and how he ends up reaching overseas just to fulfil his Guru’s wish of spreading the Krishna consciousness all over the world. The book is divided in three parts- Prabhupada’s life in India, America and the World. The most interesting one that I personally liked is the one in America which discusses his struggle in gaining the followers and popularizing the Krishna consciousness and the Hare Rama Hare Krishna chant. The impact of these two sentences is nicely discussed throughout the book. The biographer’s research on the life of Swami Prabhupada is commendable and covers many such personal events which is nearly impossible to bring out in public or say, even know about it. Kudos to author for the same. Talking about the drawbacks of the book, I must say that author should have divided the book in small chapters rather than three vast sections. This made the reading experience quite hectic where author just kept speaking continuously which becomes boring after a point of time and remains just a drag. Also, regarding the spiritual concept and belief or the meditation techniques that Prabhupada himself followed is nowhere discussed which is a very big setback for a spiritual reader who went through these 300+ pages to know new ways of meditation and spirituality. Even regarding the struggles in opening the first few centres is hardly discussed. The book just keeps on speaking the same thing for most of the middle section of the book which took me 10 days to complete this book. One of the struggling reads ever. I give this attempt 2.5 stars out of 5.